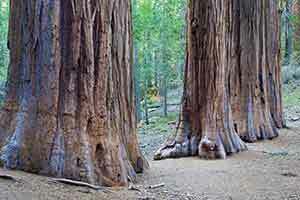 Conveniently located right next to Yosemite’s busiest entrance, a one-hour drive from Yosemite Valley, Mariposa Grove is not only the most-visited sequoia grove, but also one of the most popular sights in Yosemite, with over a million visitors per year — more than all of Sequoia National Park. The grove is on the gently-sloping south side of a minor peak. Most of the sequoias are grow in an unusual amphitheater-like basin near the summit (the upper grove), but a narrow ribbon of sequoias also spills out of the basin into a little creek valley below (the lower grove). 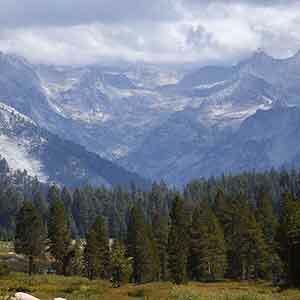 It’s in this area that the grove’s main attraction, the massive Grizzly Giant, is found. The Grizzly Giant is by far the most spectacular tree in the Mariposa Grove, and almost everyone who visits the grove is mainly here to see this tree. It’s a relatively short and easy walk to the Giant that, thanks to a $40 million dollar restoration that was finished in 2018, is really quite nice. The restoration made it easier and more pleasant to see the Grizzly Giant but harder to see the upper grove, since the trams that used to take visitors there (at least those willing to pay $26.50 per person) are no longer available. The only way to see that area is via a hike that’s surprisingly difficult due to the altitude and mostly runs through mundane woodland with only a few widely-scattered sequoias. 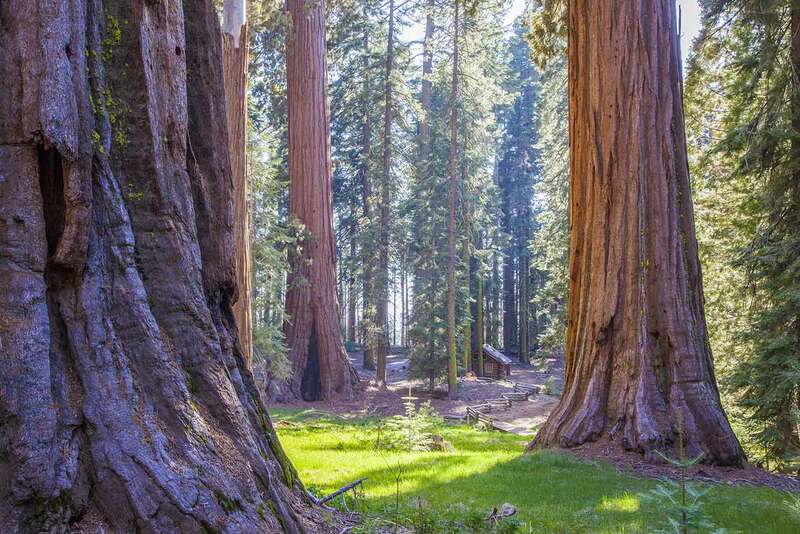 However, the payoff is well worth it, since the upper grove is where most of the sequoias are and is the most scenic and interesting part of Mariposa Grove. While the loop trail to the Grizzly Giant has a nearly constant stream of people on summer weekends, the upper grove is practically deserted. In fact it was never really that crowded even when the trams were running; it’s unfortunate that so few visitors get to see this remarkable part of Yosemite. The grove used to be much more heavily developed than it is now. In the 1930s, thanks to New Deal construction programs, the lower grove had a campground, ranger station, and barn, while the upper grove had the Big Trees Lodge with its outdoor dining terrace, tent cabins, and parking lots. 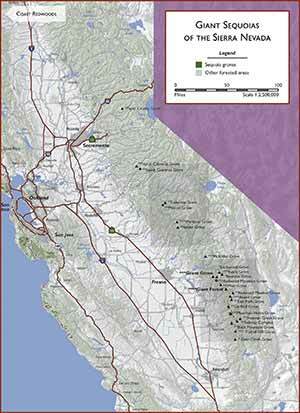 During this period several big sequoias fell, and studies placed the blame on the heavy development. As a result, the various facilities were removed beginning in the late 1950s. Here’s the trailhead location in Google Maps and Google StreetView. Park at the Mariposa Grove Welcome Plaza. The parking lot is a little confusing; as you approach the plaza, you’ll come to a closed gate with the shuttle stop and the parking lot visible on the other side. Take the unmarked road that drops off to the right and follow it as it loops all the way around to the fancy new visitor center building. Free buses run to the lower grove every 10–30 minutes; the trip takes about 10 minutes. From the shuttle stop, the hike gets off to a good start with a grand boardwalk, part of the Big Trees Loop Trail. This is actually the most impressive part of the lower grove, with quite a few sequoias. After a few hundred yards the boardwalk gives way to a half-mile-long trail lined with wooden fences that climbs to the Grizzly Giant (the trail looks like dirt but is actually a special pavement that shouldn’t get muddy). There are some big sequoias near the beginning of the trail. As the trail climbs the sequoias become widely scattered, giving way to a dense young pine forest with just an occasional sequoia. 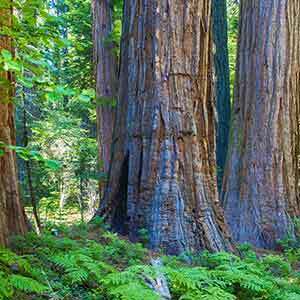 The sequoias tend to have dark trunks. There’s one notable grouping that stands out, the Bachelor and Three Graces, a popular photographic subject. 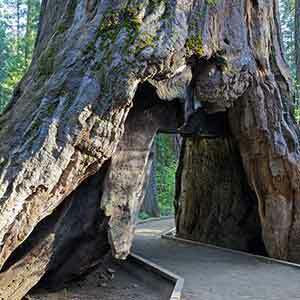 The Grizzly Giant, with its massive trunk and many enormous branches, is a truly impressive mammoth tree. 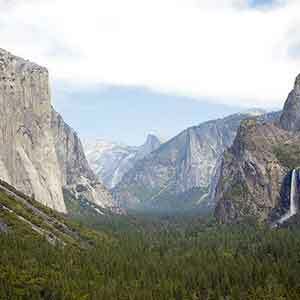 As you approach, a long, straight section of trail presents a dramatic view of the entire tree towering overhead in the crisp Sierra sunshine, one of the iconic sights of Yosemite. 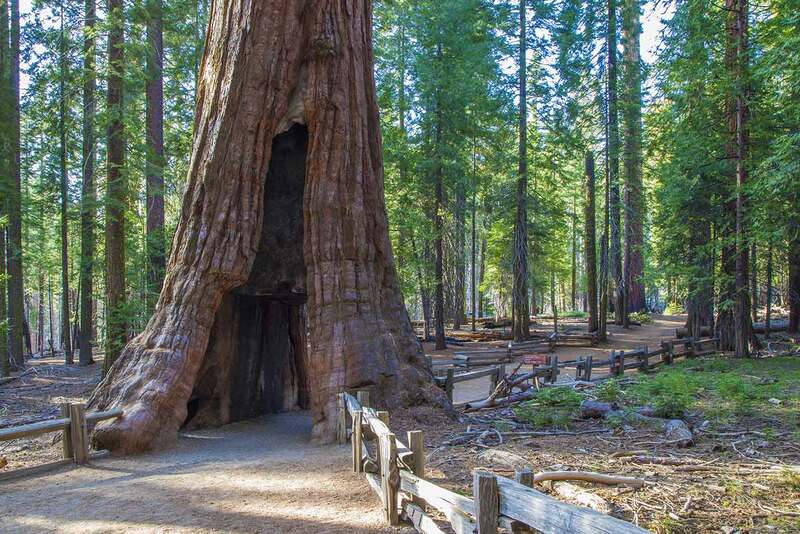 At the Grizzly Giant, stay to the left and head slightly downhill to the California Tunnel Tree, a big sequoia with a walk-through hole cut through its base. There’s always a little crowd here as everyone wants their picture taken standing in the tunnel. From here, most visitors continue on the 2-mile round-trip Grizzly Giant Loop to return to the shuttle stop. The rest of this loop is really uninteresting, though, without any more sequoias; if you only came to see the Grizzly Giant, it’s much better to just return the way you came, although if it’s busy you might feel like a salmon swimmng against the current. If you’re continuing on to the Upper Grove, the trail gets a lot quieter and less touristy after the California Tunnel Tree; you can start hiking in earnest. The wooden railing ends, the trail narrows, and the crowds diminish. There are several trails to the Upper Grove. None of them are especially interesting and they all seem to get about the same amount of traffic, so I usually just take the shortest one. This trail just has a single, big sequoia; otherwise it passes through pine forest that’s been heavily damaged by bark beetles. The many dead pine trees have been cut down, I suppose so they don’t fall and hit someone. Eventually the dense pine forest gives way to the upper grove. The upper grove is exceptionally scenic, mainly because it’s very open, an attribute that may not be natural; 3,000 understory trees were cut down in 1933 to improve the appearance of the grove. 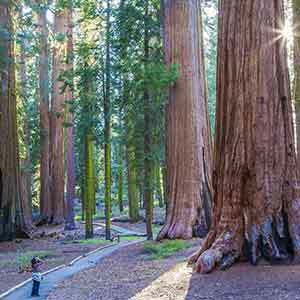 Even taking that into account, though, the grove still has a lot of exceptionally big sequoias, and they’re fine-looking examples: stout, perfectly cylindrical, and with an attractive smooth, light-colored, reddish bark. When it’s overcast they appear to glow against the background of dark foliage. The focal point of the grove is the Mariposa Grove Cabin. The cabin is now boarded up, but even when it was open, there really wasn’t much to see inside. 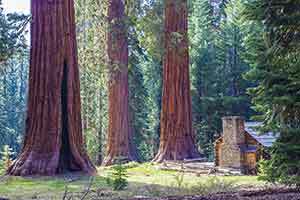 In front of the cabin is an attractive little meadow with immense sequoias in and around it. 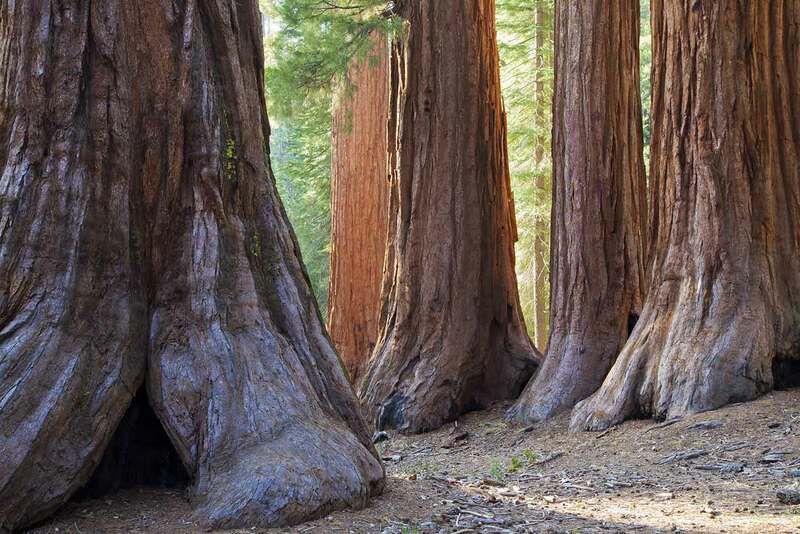 Take the trail that starts across the dirt road from the cabin and make your way to the Galen Clark Tree, a huge, stout sequoia that was the first one to be spotted by Galen Clark when he made the first documented visit to the grove in 1855. Signs point the way to the tree, but there’s no sign at the actual tree. The grove is remarkably quiet, with the only sounds coming from a few birds calling, woodpeckers drumming, and the occasional airplane. 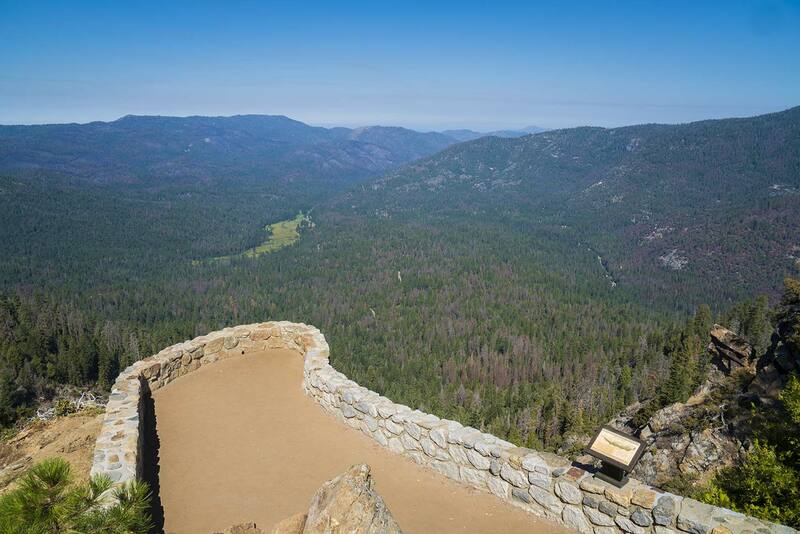 The one-mile round-trip side trip to Wawona Point doesn’t have any sequoias. The access road doesn’t have any interesting sights, but the point offers a sweeping view over the pine-carpeted Wawona valley with its large meadow. As recently as 2014 the valley was covered in a solid green carpet of trees; now it has more of a salt-and-pepper appearance, with about a third of the trees dead due to bark beetle infestations brought on by years of drought. On the way back, take the short side trip to the stout Galen Clark Tree, which is one of the most impressive sequoias in the Upper Grove. Follow the Guardians Loop Trail. This trail used to be part of the paved loop road around the Upper Grove; it’s a lot more enjoyable now that it’s been converted to a trail. It passes the fallen Wawona Tunnel Tree and then loops through the Upper Grove, offering some nice views of the varied sequoias. Signs point the way to the Telescope Tree, which is just a little ways up a side trail, but the detour isn’t really worthwhile; it’s actually kind of hard to tell which tree is the Telescope Tree. 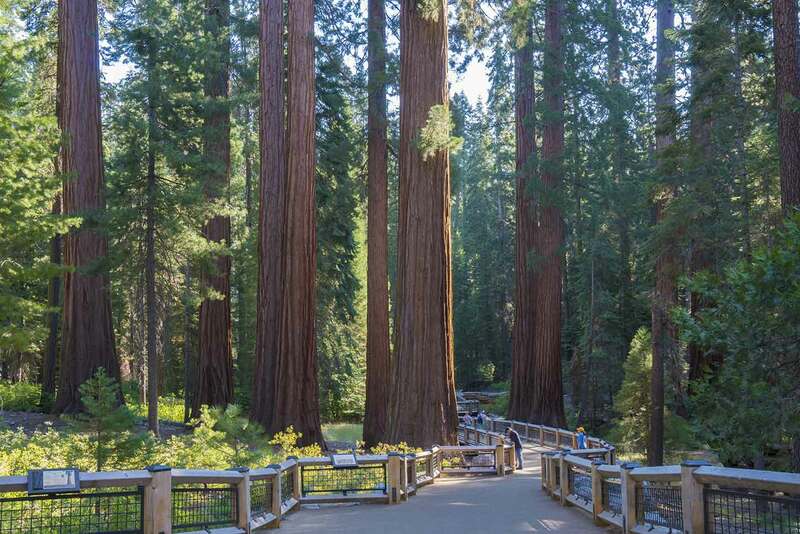 At the end of the trail, turn left onto a dirt road, which descends to a cluster of mid-sized outlier sequoias between the upper and lower groves. Here the trail passes by the Clothespin Tree with its distinctive split base; the Faithful Couple is just a few steps out of your way. The rest of the descent is pretty mundane and doesn’t have any sequoias. 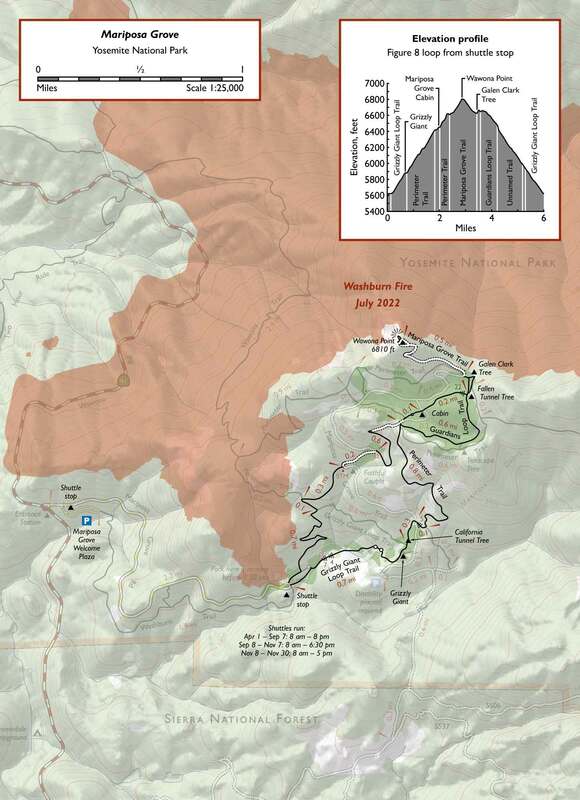 The trail gradually gets busier, especially after you join the Grizzly Giant Loop Trail. 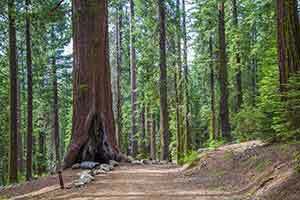 OC Trail Hikers has a post on Mariposa Grove with some nice pictures. 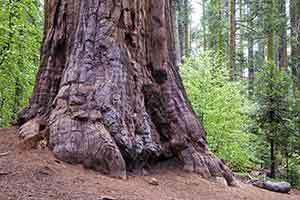 Detailed history of Mariposa Grove from the National Park Service.